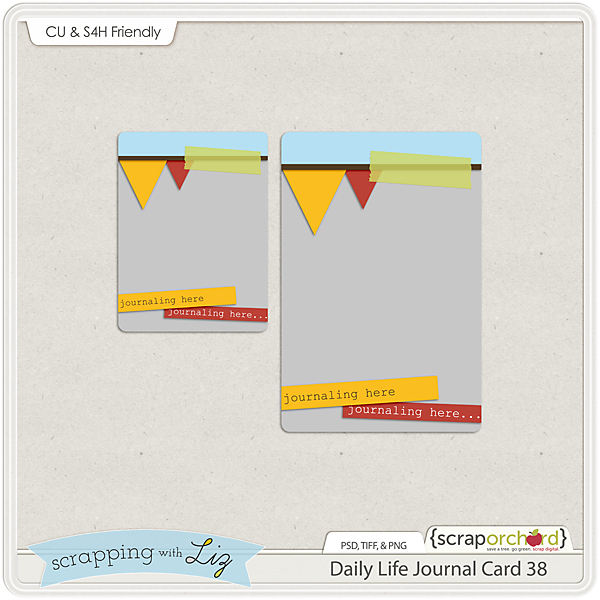 Scrapping with Liz: Daily Life Week 38: Lots of Celebrating! Daily Life Week 38: Lots of Celebrating! We did a lot of celebrating this week. My oldest daughter turned 12, we celebrated 2 years with Lydia, and my 7 year old lost a tooth! In the life of a 7 year old losing a tooth is very exciting. We also helped with our local fair and ran a 5k to help support a local Pregnancy Care Center. It was a full week. What you see on my Daily Life page is just sort of a summary. I do hope to go back and scrap more of the photos I took, but I'm glad to have this summary page done....because it's probably going to take me forever to get the rest of the pictures scrapped. That's what I love about this Daily Life Project. I can scrap a good over all look into our lives and then go and scrap more of the details later. 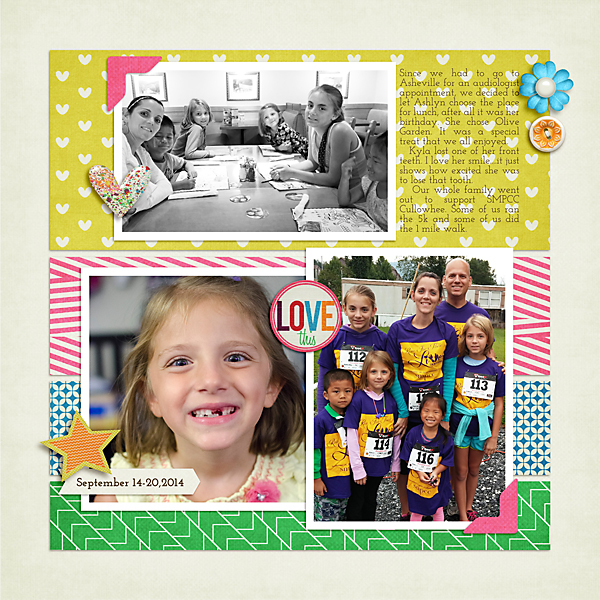 You can take a closer look below and don't forget to grab the free journal card template. This week we celebrated Ashlyn’s 12th birthday and 2 years with Lydia. Ashlyn made cupcakes and we had family over to celebrate. All the cousins got to play together in the backyard. Their favorite thing to do is ride the tricycle down the big hill. It was also fair time. Our co-op had a bake sale and helped with the big kids tent. Ashlyn and Emmie volunteered to help. I think Ashlyn’s favorite person to help is her little sister! Since we had to go to Asheville for an audiologist appointment, we decided to let Ashlyn choose the place for lunch, after all it was her birthday. She chose Olive Garden. It was a special treat that we all enjoyed. Kyla lost one of her front teeth. I love her smile....it just shows how excited she was to lose that tooth. Our whole family went out to support SMPCC Cullowhee. Some of us ran the 5k and some of us did the 1 mile walk. Thank you so much! 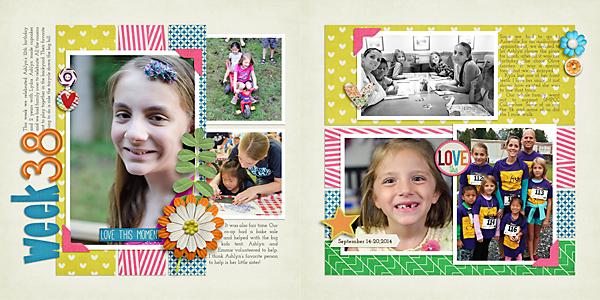 I just love your journaling cards. Wonderful! How fun to celebrate so many things in one week! Happy birthday to Ashlyn! Thank you so much for this journal card! Daily Life Week 36: So Blessed!